Orders are final once sent to press. 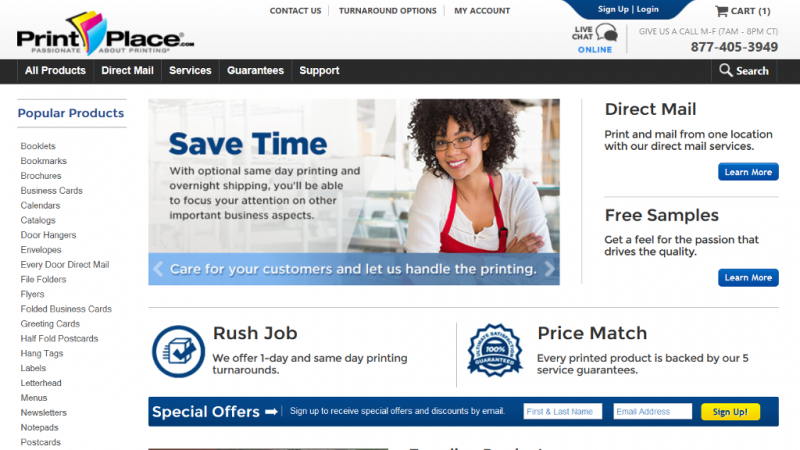 Print Place offers a service for people to place printing orders online. They have a completely automated system that integrates the ordering process, the manufacturing of the print order and shipping that allows them to offer some of the fastest turnaround times with the best prices in the industry. They have multiple manufacturing locations (over 200,000 square feet) that can handle orders that range from a few hundred items to millions. Print Place offers a wide range of products that you can get printed, 26 to be exact. This includes everything from Booklets and Brochures to Menus and Presentation Folders (and everything in between). When deciding what to order you have a number of options to choose from. Depending on the product, Standard options for most projects includes paper/page size and paper type. You also pick the quantity and ink options. The last options available are turnaround time (which can range from 7 days to same day) and proof type (electronic or mailed). Many Finishing options for your project are also available. These options depends greatly on the product being printed, some of them include front and back finish, folding, hole drilling, scoring, shrink wrapping and corner options. Many products also include a custom trim option. All product types includes a number of templates which provide specifications to ensure your artwork prints correctly. Marketing tips are also available to help you maximize the full potential of your project. Many of the Print Place products can have custom options, or if you cannot create exactly what you want with the online web interface you can just go right ahead and create your own custom project. You just fill in a simple form with your project details. Once completed a custom quote specialist will get in contact with you either via email or phone with any further question they may have along with a quote. 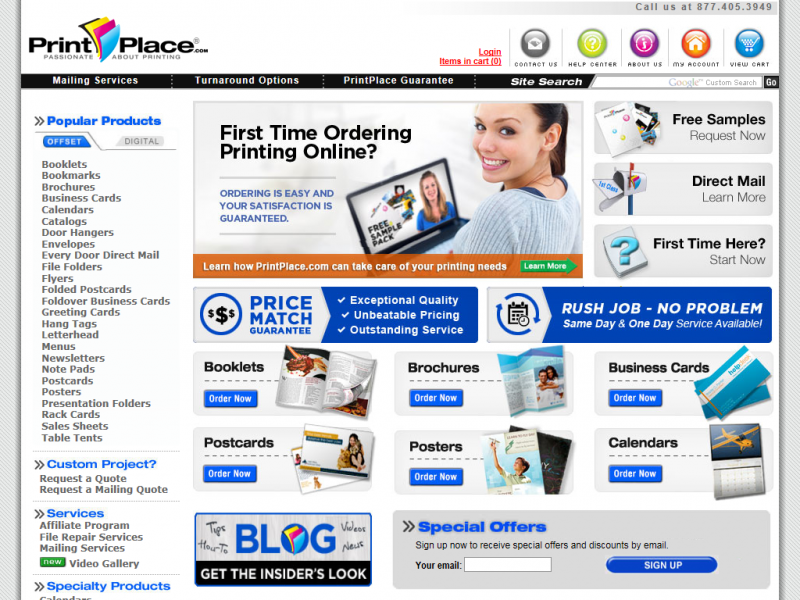 PrintPlace.com also offers a number of related printing services. This includes a mailing services and file repair and corrections. The mailing service allows your business to run direct mail campaigns more efficiently since the printing and mailing is taken care of by one company, Print Place. Multiple mailing lists can be submitted or if you need a targeted mailing list, Print Place can create one for you at an affordable price that will meet your marketing goals. The mailing service includes duplication removal, CASS Certification, tabbing, inkjet addressing, postal pre-sorting and delivering to USPS. The file repair service for a small fee will fix most non design problems with your art work. This includes adding bleeds, caution zones and centering. They will also combine files and create pdf files for you so you can upload your print job. This service will also embed fonts into your upload along with repairing minor type changes. PrintPlace.com covers all of your printing needs and is backed by a 100 percent satisfaction guarantee. They have multiple high-tech printing facilities and a dedicated customer service department which is extremely knowledgeable and helpful. We have yet to have an issue with Print Place and give them a strong recommendation based on their fast turnaround times and above average print quality.